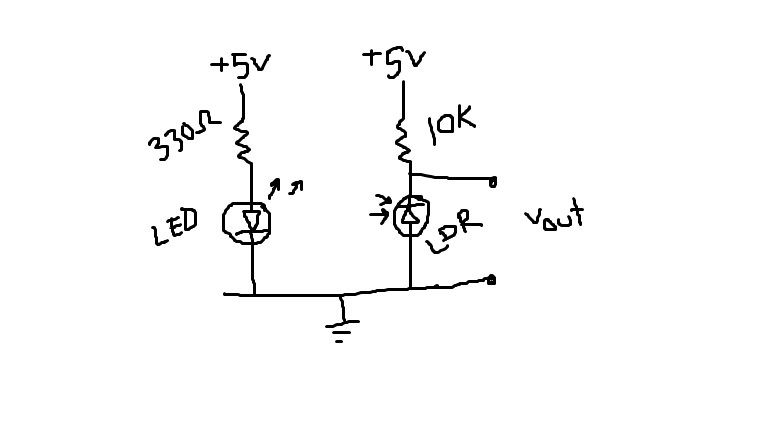 Hi i want to know why we connect IR receiver's positive terminal to ground and negative terminal to the end of a resistor from 5v? what's the reason? because we always connect positive to positive nd negative to negative. You write LDR but do not use the symbol for LDR. Instead your symbol shows photo-diode. What do you really use? If it is a diode, as you show, that configuration responds to the diode "leakage" or "reverse" current. This current depends on the light intensity. Thus, it has to be connected "backwards" compared to normal diode forward bias. By the way, this has nothing to do with AVR so it should go in the General Electronics forum. I don't think you can use photodiode voltage output, it is in the order much below 1 volt, if not tens of millivolts at 10k load. Looks like he's drawn a photodiode to me. Often you use a photodiode with the cathode to + like you've drawn. The diode is reverse biased and no current flows. When a photon hits the junction, and with any IR source, you're looking at LOTS of photons, it creates an "electron-hole" pair and an electron flows through the diode. Use a micro to blink your IR led, and you should be able to see a signal on the output with your scope. Or, turn your IR led on and off slowly and you should be able to see the output change with a meter. Photo-diodes work in two ways. One is the way that he and I described, where the mechanism is reverse leakage current that depends on light. Second is in the forward direction, There are in turn, three ways that it works in the forward direction. (1) Forward voltage that depends on light; typically no more than a few hundred millivolts open circuit. Or (2) Forward current that depends on light, usually pretty small for an ordinary diode because it depends on diode junction area and usually measured through a short circuit. Or (3) a combination of (1) and (2), usually with a fairly low value load resistor. For the application that the OP describes, his schematic is probably correct if you remove the "LDR" label. One small point - no common ground is needed between the input and output sides. Light is all that is needed. The common ground does not hurt, as in the case of photo-interrptors, but is is certainly NOT necessary. One of my first attempts on my own was to see if I could send sound from a tape recorder to a receiver. I took the headphone output to a transistor amplifier to an LED. Then on the other end of the breadboard, a phototransistor to an op-amp to a transistor output stage to a little speaker and .... Wow! It works first try! The LED flickers and the speaker speaks! Then I noticed that I'd stuck my photo transistor in the wrong hole and it wasn't even connected to the circuit. Never did figure out how the tape player output was getting coupled to the output amplifier. Just some things to take note of. Just make sure that the IR TX & RX wavelengths spectrum are matched. Some IR TX will not work with some IR RX. Some require the IR to be modulated. Tip: To make sure there is IR coming fom the TX, use your phone camera! Thank you very much ka7ehk, torby,and ldevries. These were really helpful.